During the past decade considerable research has been conducted into the use of cardiac troponins, their diagnostic capability and their potential to allow risk stratification in patients with acute chest pain. Determination of risk in patients with suspected myocardial ischaemia is known to be as important as retrospective confirmation of a diagnosis of myocardial infarction (MI). Therefore, creatine kinase (CK)-MB - the former 'gold standard' in detecting myocardial necrosis - has been supplanted by new, more accurate biomarkers.Measurement of cardiac troponin levels constitute a substantial determinant in assessment of ischaemic heart disease, the presentations of which range from silent ischaemia to acute MI. Under these conditions, troponin release is regarded as surrogate marker of thrombus formation and peripheral embolization, and therefore new therapeutic strategies are focusing on potent antithrombotic regimens to improve long-term outcomes. Although elevated troponin levels are highly sensitive and specific indicators of myocardial damage, they are not always reflective of acute ischaemic coronary artery disease; other processes have been identified that cause elevations in these biomarkers. However, because prognosis appears to be related to the presence of troponins regardless of the mechanism of myocardial damage, clinicians increasingly rely on troponin assays when formulating individual therapeutic plans. Ischaemic heart disease comprises clinical conditions that range from silent ischaemia to acute MI. Along with the patient history, physical examination and electrocardiography, measurement of biochemical markers is important in assessing ischaemic heart disease. The 'gold standard' in detecting myocardial necrosis has been an elevated level of CK-MB (the cardiac-specific isoform of CK). This measure satisfies the criteria for a diagnosis of MI (Table 1), as proposed by the World Health Organization and later extended for the Monitoring Cardiovascular Disease (MONICA) study . New cardiac markers, however, with superior specificity and sensitivity to detect myocardial damage and the potential to estimate the prognosis of patients with ischaemic myocardial necrosis, have challenged the diagnostic ability of CK-MB. Furthermore, elevated CK-MB may not detect all myocardial necrosis, because autopsies of patients who died suddenly after severe or silent episodes of ischaemia have shown micronecrosis that was not reflected in routine enzyme measures [2,3]. In addition, myocardial biopsies taken during coronary artery bypass surgery in patients with unstable angina have shown the presence of platelet aggregates in small coronary vessels, with associated myocardial necrosis . *Revised 1994 for the MONICA study . New cardiac markers, such as troponins T, I and C, are subunits of the thin filament-associated troponin-tropomyosin complex, which is involved in regulating muscle contraction. Genetic differences in cardiac and skeletal muscle tissue have allowed development of monoclonal antibodies that are specific for release of cardiac troponins T and I during myocardial injury [5,6]. Sporadic reports [7,8] confirmed the ability of troponins to identify micronecrotic pathology, despite exclusion of MI on conventional grounds. Accordingly the new definition of MI reported in September 2000  introduced cardiac troponins into daily routine clinical practice, allowing for highly accurate, sensitive and specific determination of myocardial injury (Table 2). Moreover troponin measurement is recommended in all patients with chest discomfort that is consistent with an acute coronary syndrome . Development of new pathologic Q-waves on serial electrocardiographs. The patient may or may not remember previous symptoms. Data from the European Society of Cardiology/American College of Cardiology consensus document . The present review focuses on the potential of troponin measurement to identify myocardial damage of any origin, and the resulting diagnostic and therapeutic implications. Biochemical markers provide evidence of cell degradation, which forms the rationale for diagnosis of a disease using such markers; that is, detection of intracellular constituents that are released into the blood (when the cell ruptures or loses membrane integrity) allows identification of damaged target tissue. Changes in serum concentration of these markers are primarily determined by their molecular masses and intracellular compartmentalization (Table 3). CK and CK-MB exhibit a release pattern during MI that is characteristic of a functionally unbound, cytosolic protein, which is strongly dependent on perfusion in the infarct zone . In contrast, the cytosolic pool has been estimated at 6% for troponin T and 3% for troponin I, resulting in release kinetics that are typical of both structurally bound and cytosolic molecules [12,13]. In cases of slow disintegration of myofibrils, the 'early' cytosolic pool, combined with the features of a bound myofibrillar protein, results in a continuous release of troponin to a diagnostic threshold that is strongly associated with adverse outcomes. CK-MB is less abundant in the myocardium on a weight basis (with small amounts normally present in the circulation), but is cleared more rapidly than troponin T or I. During repeated episodes of minor myocardial necrosis, CK-MB may be elevated at each episode, but the increase is blunted by the baseline amount present and by the rapid clearance of the marker. In contrast, troponins have a negligible baseline value and are cleared much more slowly, and therefore they accumulate in the circulation (Fig. 1). This may partly explain why some patients with acute coronary syndromes have elevated troponin values - caused by superimposing recurrent microinfarction events - but normal CK-MB at presentation. However, release of troponins is indicative of myocardial necrosis, but is not synonymous with an ischaemic mechanism of the injury. Therefore, an elevated troponin value in the absence of clinical evidence of ischaemia should initiate a search for other causes of myocardial damage. Table 4 summarizes possible causes of elevation of troponins in blood. Summation model. 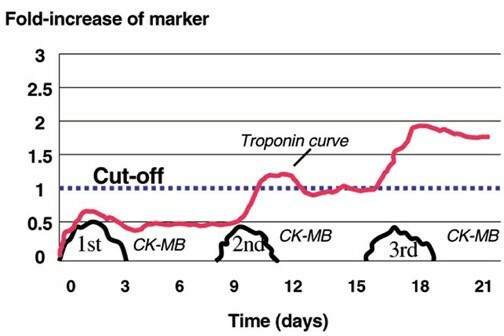 Temporal release of cardiac markers CK-MB and troponins during repetitive episodes of ischaemia causing myocardial necroses in the setting of an acute coronary syndrome. Compared with the release and clearance of CK-MB 48-72 h after each episode (indicated as 1st, 2nd and 3rd), troponin release is cumulative. Troponin assays have evolved during the past decade, and the latest rapid assays have provided emergency room physicians with new diagnostic approaches . 'Point-of-care' assays can be performed without sophisticated equipment, even by paramedics . The first enzyme-linked immunosorbent assay for troponin T measurement was produced in 1989, with an assay cutoff of 0.5 ng/ml and a turnaround time of 90 min . The most recent version is the Elecsys® third-generation assay (Roche Diagnostics Corporation, Indianapolis, USA). This assay uses recombinant human cardiac troponin as the standard. It has improved precision, particularly at the low end of the measuring range, with an analytical sensitivity of below 0.025 ng/ml and a diagnostic cutoff of 0.1 ng/ml . Only one manufacturer provides a troponin T assay, whereas various available assays may be used to measure troponin I, using different antibodies that are directed against different epitopes [[18–24]]. Because of the lack of standardization in troponin I assays, up to 10-fold differences have been reported in absolute concentrations, at cutoffs that range widely. The absence of a standardized discriminator led to investigators using either the cutoff recommended for the diagnosis of MI, the limit of assay detection, or their own discriminators generated from retrospective analysis of selected patient cohorts. Thus, attention must be given to the assay used when interpreting the data and the results of troponin I measurements. Compared with CK-MB, the former 'gold standard' in diagnosing MI, troponin measurement offers substantially better sensitivity for the detection of myocardial injury. Release kinetics of troponins T and I are similar; both are released within 4-12 h after myocardial necrosis, with a peak value 12-48 h from symptom onset (Table 3), depending on the duration of ischaemia and reperfusion. Use of troponin T for noninvasive assessment of coronary artery reperfusion after successful thrombolysis has been described [12,25]; troponin T exhibited a typical biphasic release, which is not seen with troponin I. Katus et al  found 100% sensitivity and 93% specificity for a first-generation troponin T assay in 388 patients with MI. Although the cardiac specificity of troponin T has been questioned, particularly in patients with renal failure , a recent immunohistochemical study  established that troponin T isoforms expressed in renal diseased skeletal muscle are not detected by the second- and third-generation troponin T assays. With regard to sensitivity, a meta-analysis  showed that troponin T had a clinical sensitivity of 98.2% (95% confidence interval [CI] 97-99%) for diagnosis of MI within 12 h after symptom onset, which is similar to the 96.8% (95% CI 95-98%) sensitivity of CK-MB. Specificity, however, was significantly greater for CK-MB than for troponin T (89.6% versus 68.8%; P < 0.001), because patients with minor myocardial injury also had positive troponin T results. However, it has also been shown [[30–32]] that troponin sampling early after symptom onset (<4 h) results in a sensitivity of only 33-49%. More recent studies [20,33], which took the known delay in release into consideration when defining the sampling pattern, described diagnostic sensitivities of 77-100% for detection of MI more than 6 h after onset of pain. Thus, in order to achieve optimal sensitivity, serial sampling at least 12 h after symptom onset is recommended. In patients with chest pain at rest but without ST-segment elevation, it is difficult to distinguish unstable angina from MI, either clinically or angiographically . However, the extent of myocardial necrosis is an important predictor of prognosis , and therefore early identification of patients who are at high risk for an adverse outcome is as important as confirming a diagnosis of MI. In 1992, the prognostic value of troponin T was shown convincingly . Patients with class III unstable angina (Braunwald classification) with elevated troponin T levels had a heightened risk for major cardiac events during and after hospitalization, as compared with troponin T-negative patients (15% versus 1.9% for in-hospital death or MI; P = 0.003). The risk for nonfatal MI or death over different intervals after an index event was addressed in several studies of patients with unstable angina. Event rates for troponin T-positive patients were significantly higher, confirming that these patients represent a high-risk subset of the acute coronary syndrome continuum. The Fragmin during Instability in Coronary Artery Disease (FRISC) trial  noted a strong correlation between elevation of troponins and mortality at 30 days and at 5 months. Stubbs et al  showed the potential of troponin T for long-term risk stratification of selected patients with unstable angina. During a median 3-year follow-up period, 29% of troponin T-positive patients versus 17% of troponin T-negative patients died or had an MI (P = 0.07). After adjusting for revascularization, this difference reached statistical significance (P = 0.042). In the Global Utilization of Streptokinase and t-PA for Occluded Coronary Arteries (GUSTO)-IIa troponin substudy , baseline troponin T level was a powerful, independent marker of short-term risk. After multivariable adjustment for CK-MB level and electrocardiographic category, baseline troponin T level was a strong predictor of 30-day mortality (Χ2 9.2; P = 0.027). This difference in mortality rates for troponin T-positive and -negative patients was maintained at 1 year (14.1% versus 4.5%; P < 0.0001) . A meta-analysis of several studies in over 4000 patients  calculated risk ratios for death or MI for troponin T positivity of 2.7 (95% CI 2.1-3.4; P < 0.001) and for troponin I positivity of 4.2 (95% CI 2.7-6.4; P < 0.001). Still, the odds ratios (ORs) for an adverse outcome vary substantially between the studies. A recently published investigation  refined the levels of risk for elevated troponins in the setting of acute coronary syndromes. A meta-analysis of a large database was conducted; by considering the diversity of follow-up duration, that analysis allowed for a more precise estimation of risk. However, consistent with earlier studies, results showed pooled ORs of 2.86 (95% CI 2.35-3.47; P < 0.0001) in patients with ST-segment elevation and 4.93 (95% CI 3.77-6.45; P < 0.0001) in patients without ST-segment elevation for the risk of cardiac death and MI at 30-day follow up. That analysis emphasized the potential of troponins to detect myocardial micronecrosis in the absence of ST-segment elevation and to predict heightened risk in these patients. In 240 patients with ST-segment elevation, Stubbs et al  described higher 30-day mortality in those who had troponin T levels greater than 0.2 ng/ml on admission (Χ2 13.3; P = 0.0002). At a median 3 years of follow up, there was nearly a fourfold difference in survival. The Thrombolysis in Myocardial Infarction (TIMI)-IIIb substudy  showed that mortality rates increase with increasing levels of troponin I; at 42 days the mortality was 7.5% in patients with the highest level of troponin I. In the GUSTO-III trial , troponin T was measured qualitatively in 12,666 patients with ST-segment elevation who were randomized to receive alteplase or reteplase. Patients with a positive troponin T result at baseline had significantly higher 30-day mortality than did troponin-negative patients (15.7% versus 6.2%; P = 0.001). Troponin added independently to the prediction of 30-day mortality, even after adjustment for major risk factors, including symptom duration (Χ2 46; P = 0.001). Of particular interest is one study that included 90-min angiography, which also assessed baseline troponin T levels in 100 patients with acute MI receiving aspirin and intravenous streptokinase . Troponin T-positive patients (= 0.1 ng/ml) were significantly less likely to have TIMI grade 3 flow at 90 min than were patients with a negative baseline troponin T (32% versus 62%; P = 0.01), suggesting less effective reperfusion in those who were positive for troponin T.
Apple et al  reported a significant, inverse relationship between peak troponin T values and left ventricular function as assessed by echocardiography (r = 0.46; P = 0.04). It has also been shown that, among patients with severe heart failure of various origin, the 18-month mortality for the 60% who were troponin T positive was significantly higher than for troponin T-negative patients (61.1% versus 8.3%; P = 0.0093) . Thus, the troponins have some predictive value in left ventricular impairment. Patients who present to the emergency room with acute chest pain represent a heterogeneous cohort, with symptoms that are compatible with MI but low clinical likelihood of significant heart disease. For clinicians, it is of particular interest to identify those patients with an ischaemic mechanism of myocardial necrosis, who are known to be at heightened risk. Accumulating data confirm the potential role of troponins in risk stratification in chest pain cohorts not only in the short term, but also in the long term. In 1047 patients with chest pain and electrocardiographic evidence of ischaemia, the subset who were troponin I positive (cutoff 0.4 ng/ml) had an adjusted OR of 1.8 (95% CI 1.1-2.9) for major cardiac events within 72 h . Using logistic regression analysis, Hamm et al  showed that, even after adjustment for electrocardiographic categories, either troponin T or troponin I rapid assays made a highly significant contribution to prediction of 30-day outcomes in patients seen in the emergency department. Recently, it was convincingly demonstrated  that positive rapid bedside troponin T assay results in patients with suspected acute coronary syndrome remained a strong predictor of long-term mortality (relative risk [RR] 4.3, 95% CI 1.3-14.0). These studies particularly strengthen the role of point-of-care testing, and suggest that even a qualitative test result might be useful for emergency medicine care givers. In patients with an acute coronary syndrome, increased troponin levels must be regarded as a marker for ischaemia caused by platelet activation and aggregation, with subsequent distal embolization of thrombi leading to necrosis. Angiographic findings strongly support the hypothesis that troponins are surrogate markers of thrombus formation. Angiograms performed in the c7E3 Fab Antiplatelet Therapy in Unstable Refractory Angina (CAPTURE) trial  showed visual thrombi to be more frequent in troponin T-positive patients (11.6% versus 4.0%; P < 0.01), and that these patients had greater thrombus resolution and a greater reduction in clinical outcomes after treatment with abciximab than did troponin T-negative patients. As a result, potent antithrombotic agents have been assessed for their ability to prevent ischaemic events in acute coronary syndromes, especially in troponin-positive patients. Among 976 patients from the FRISC trial , those with troponin T levels < 0.06, 0.06-0.18 and >0.18 ng/ml during the first 24 h after admission had a 4.3, 10.5 and 16.1 risk for death or MI, respectively. Outcomes did not differ between patients with unstable angina versus MI among the groups. Dalteparin treatment predominantly reduced the rate of death or MI in troponin-positive patients, from 6.0 to 2.4% (RR 0.41, 95% CI 0.18-0.92). This benefit was maintained at 40 (RR 0.52, 95% CI 0.32-0.83) and 150 days (RR 0.78, 95% CI 0.56-1.09). Among high-risk patients with non-ST-segment elevation acute coronary syndrome and negative CK-MB measures who were enrolled in a TIMI-IIB substudy , 50.1% were troponin I positive (>0.1 ng/ml). Elevated troponin I values during the first 24 h were strongly associated with an adverse clinical outcome during 48 h and at 14 days. Furthermore, treatment with enoxiparin conferred greater benefit among those patients with abnormal troponin I values, resulting in a 47% reduction (P = 0.001) in the composite end-point (death, MI, urgent revascularization) at 14 days. In patients with refractory unstable angina, abciximab treatment reduced MI before, during and after angioplasty . More recently, the benefit of abciximab has been shown to be greater in patients with elevated troponin T (>0.1 ng/ml) . The RR of death or nonfatal MI for those given abciximab versus placebo was 0.32 (95% CI 0.12-0.49; P = 0.002), which was mostly attributable to a reduced rate of MI (P < 0.001). This was not seen in troponin T-negative patients (OR 1.26, 95% CI 0.74-2.31; P = 0.47). Other glycoprotein IIb/IIIa receptor blockers, such as tirofiban, have exhibited consistent reductions in death and nonfatal MI . Combination therapy with heparin plus tirofiban in the Platelet Receptor Inhibition in Ischemic Syndrome Management (PRISM)-Plus trial  resulted in lower peak levels of troponin T as compared with heparin alone (5.2 ± 8.3 ng/ml versus 15.5 ± 29.1 ng/ml; P = 0.017). A possible correlation between intracoronary thrombus and clinical outcome was also addressed in that trial . Patients with intracoronary thrombus had a significantly higher rate of death or MI than did patients without thrombus (19% versus 10%; P < 0.001). A preferential benefit from glycoprotein IIb/IIIa blockade in patients with acute coronary syndromes was recently confirmed in a substudy of the Platelet IIb/IIIa Antagonism for the Reduction of Acute coronary syndrome events in a Global Organization Network (PARAGON) B trial . Treatment of troponin T-positive patients with lamifiban yielded in a 42% reduction in death or MI (P = 0.02), resulting in an event rate approaching that of troponin T-negative patients. Accordingly, the heightened risk associated with elevated troponin T levels was 'neutralized' by early administration of a glycoprotein IIb/IIIa blocker. These data illustrate how a biochemical marker of heightened risk, resulting in application of potent antithrombotic therapies, may be used to improve outcomes of patients with acute coronary syndromes. However, preliminary results from the GUSTO IV ACS trial (Simoons ML, 2000, unpublished data) question the new concept of administration of glycoprotein IIb/IIIa blockers in patients with acute coronary syndromes and elevated troponin levels. This was the first study to show that, among patients with non-ST-segment elevation acute coronary syndrome who were not scheduled for coronary angiography, the efficacy of abciximab was not superior to that of placebo. This is particularly noteworthy because the risk stratification according to troponin status was estimated similarly to that in other studies. A possible explanation might be that the patients in that trial were not selected for early cardiac catheterization, although other studies showed beneficial effects of glycoprotein IIb/IIIa blockade in patients who did not undergo revascularization. The value of early, invasive approaches (angiography with or without revascularization) is controversial. In the TIMI-IIIB trial , mortality was greater overall in patients with a troponin I level greater than 0.4 ng/ml (RR 1.11, 95% CI 1.05-1.17; P = 0.016), but not in the subgroup of troponin I-positive patients who were randomly assigned to the invasive strategy (RR 0.92, 95% CI 0.86-0.98; P = 0.024). Data from the GUSTO-IIa substudy , in which physicians were blinded to the troponin results, show that troponin T-positive patients who underwent revascularization had 1-year mortality similar to that in troponin T-negative patients (6.3% versus 6.2%; P = 0.78). However, in patients who did not undergo angiography, 1-year mortality for troponin T-positive patients was substantially higher than that in troponin T-negative patients (37% versus 11%; P = 0.001). The suggestion that early revascularization may also modify outcomes in patients at high risk was confirmed by recently presented data from the FRISC-2 study. In a substudy  the influence of troponin T elevation and ST-segment depression on the effects of an early invasive versus noninvasive strategy was addressed in a randomized manner. A 29.7% reduction in incidence of death and MI during a 1-year follow-up period was observed in troponin T-positive patients (RR 0.70, 95% CI 0.55-0.90; P = 0.005). This was also seen when troponin T elevation was combined with ST-segment depression at entry. Troponins have high sensitivity for detection of minor myocardial injury after angioplasty or atherectomy that is strongly related to lesion morphology, side-branch occlusion, dissections or severe vessel spasm, and periprocedural infarction. However, the prognostic value of periprocedural myocardial damage remains elusive. In a recent study  elevation in troponin I after elective successful angioplasty, although more frequent than elevation in troponin T or CK-MB, was not an important correlate of cardiac events during 1-year follow up (P = 0.34, log-rank analysis). Multivariate analysis identified time of balloon inflation (OR 9.2; P = 0.0012) and type B lesion (OR 6.6; P = 0.013) as the most significant predictors of troponin I elevation. The occurrence of Q-wave MI after bypass surgery adversely affects long-term survival . Although troponins possess the required specificity to differentiate between surgical trauma to skeletal muscle and myocardial damage, separating new episodes of ischaemia may be difficult because troponins are detectable in the bloodstream for relatively long periods [12,13]. However, the serum troponin T peak level on day 4 after cardiac surgery has been demonstrated to indicate perioperative MI as indicated by the presence of new Q waves , and serum troponin I levels that exceed the concentration caused by cannulation and cardioplegia can indicate perioperative MI with high probability . If an ischaemic origin of the cardiac injury is unlikely, then other causes have to be considered. Subendocardial injury due to increased wall stress might induce a rise in troponins in patients with congestive heart failure , as do episodes of extreme hypertension, tachycardia or right ventricular injury in patients with pulmonary embolism. Alternatively, increase in biomarkers may occur after severe blunt trauma to the thorax causing myocardial contusion , or in response to severe hypotension or release of endogenous substances in critically ill patients (ie patients with multiple-organ dysfunction syndrome after traumatic shock) [69,70]. Furthermore, increased levels of troponins were observed in patients with pericarditis , suggesting involvement of the myocardium in the inflammatory process. However, the diagnosis of myocarditis can only be confirmed by immunohistochaemical techniques. Lauer et al  reported myocyte injury as detected by troponin T in 35% of patients with immunohistologically confirmed myocarditis, yielding a positive predictive value of 93% for the biomarker. The extent to which knowledge of the troponin status could impact on medical care under these conditions deserves further investigation. In noninvasive estimation of acute heart-allograft rejection, increasing troponin T levels that paralleled the severity of graft rejection were of prognostic and diagnostic value . Whether the elevation in levels of troponins can also indicate future development of coronary artery disease in heart transplant patients must be investigated prospectively. Patients with end-stage renal disease are at significant risk for major coronary events. The likelihood that dialysis patients will die from cardiac causes has been estimated to be approximately 20 times higher than in the general population . The clinical value of troponins to rule out MI or to identify high-risk patients has been questioned, because some studies have noted apparently false-positive results for troponin T in patients receiving dialysis. Debate continues as to whether increased levels of troponin T in those patients result from re-expression of troponin T in skeletal muscle  or from 'uraemic cardiomyopathy' with subclinical myocardial injury . However, the observation of troponin T re-expression in patients with severe renal disease was questioned by Haller et al , who found no evidence for troponin T expression in truncal skeletal muscle caused by uraemia, which strengthens the argument for troponin T originating from heart muscle. Clinically, troponin T and I measures have been compared in patients with end-stage renal failure in order to investigate how the biomarkers are affected by dialysis and whether troponins could predict prognosis in those patients. Of note was that dialysis increased troponin T values, but decreased troponin I values (cutoff 0.4 ng/ml) ; this effect was independent of the dialysis membrane used. In accord with previous findings, elevation of either troponin T or I correlated with adverse cardiac outcomes. Because second- and third-generation troponin T assays detect only those troponin T isoforms that are expressed in the adult human heart , the assumption of false-positive results can be refuted, and clinically undetected minor myocardial injury should be considered when troponin T values are positive in end-stage renal disease patients. However, several authors favour troponin I for risk stratification of renal failure patients, and report superior prognostic value for long-term outcome. This was not confirmed by Van Lente et al , who reported reduced sensitivity and specificity for adverse outcome in patients with renal insufficiency and suspected cardiovascular disease as assessed using both troponin T and I (cutoffs 0.02 and 0.35 ng/ml, respectively); a case-match approach showed no advantage of one troponin over the other. Measurement of cardiac troponins has gained a leading position in the field of biochemical diagnosis of myocardial necrosis, as compared with conventional CK-MB measurement. Data reported during the past decade have indicated superior efficacy for troponins T and I in the diagnosis of myocardial damage, which even reflect microscopic zones of myocardial necrosis. According to the new definition of MI , cardiac troponin (T or I) is the preferred biomarker for the routine diagnosis of MI. However, retrospective confirmation of MI is no longer the sole role of a cardiac marker. In patients with acute coronary syndromes, troponin release must be regarded as a marker of thrombus formation and peripheral embolization. Moreover, troponins offer the potential for early risk stratification, greatly enhancing our ability to develop new therapeutic approaches. Given the heterogeneity of troponin values and cutoff points, it is not clear whether the exact magnitude of troponin elevation is essential for clinical decision making. It appears that patients who are identified to have an 'active thrombotic process' are those who would predominantly benefit from antithrombotic treatment. Therefore, dichotomizing patients as 'troponin positive' or 'troponin negative' appears adequate for risk stratification, and ST-segment depression could add further information. However, efforts must focus on standardization of the troponin I assay in order to avoid confusion associated with different cutoffs. Clinical laboratories must also pay careful attention to the quality of assays, because clinicians will now use the troponins for enhanced diagnostic and therapeutic decision making. Until now, no standardized regimen has existed for the treatment of those patients who are identified as being in a high-risk subset in the heterogeneous population of unstable angina patients. At least the failure of thrombolytic therapy to improve prognosis has been clearly demonstrated. If it is now accepted that any amount of myocardial necrosis caused by ischaemia should be regarded as an infarct, then the correct way to view troponin-positive patients is that they are experiencing momentary microinfarction. Such a change in the definition of infarction would result in a profound increase in sensitivity and specificity of the biomarker. More patients would be correctly identified as having MI, and fewer false-positive results would be found. With that knowledge, it appears even more important to adapt treatment guidelines appropriately. At present anticoagulation with intravenous unfractioned heparin or subcutaneous low-molecular-weight heparin is recommended, and a platelet receptor glycoprotein IIb/IIIa antagonist should also be administered in patients with high-risk features or in whom a percutaneous intervention is planned. Although these recommendations are derived from predominantly retrospective analyses, they satisfy the current American College of Cardiology/American Heart Association guidelines for the management of patients with unstable angina and non-ST-segment elevation MI . Troponins T and I constitute the new 'gold standard' for detection of myocardial necrosis and risk stratification. Nevertheless, further prospective studies are needed for stratification of different levels of risk and accordingly treatment, in particular now that controversial results of the current studies are accessible.